In Town of Telluride... NON-SMOKING HOME... Luxury Family Victorian home with a jetted SPA on the deck to enjoy the majestic peaks by day and stars at night. Dine on the deck outdoors or enjoy the inside dining area with awesome mountain and river views. Quiet and private, in Town, free shuttle service to the free Gondola comes to the corner. Walk across the street to the Telluride Festivals at Town Park with kids fishing area and swimming pool and full nordic ski area. We have fantastic unobstructed views of the San Miguel River, and Bear Creek and majestic mountain views (SEE 50 more photos Links to more information above Owner Profile as well as a Google satellite view that you can navigate to see town, etc.). Walk the famous San Miguel River Walk or bicycle around to everything. Fully furnished home and quality kitchen. Hardwood floors on main level, and carpet in bedrooms. Parking. Now HD flat panel TVs in all 3 bedrooms and great room (not in all photos). The upstairs Master bedroom suite has a king-size bed with TV, bay window for reading and relaxing to take in the big Peaks views, and a full desk with BROADBAND computer hookup, and bath and laundry area; the Downstairs Guest bedroom has a queen size bed and bay window and bath; and the upstairs bunkroom sleeps 4 in separate beds with Cable TV. All beds have Ralph Lauren sheets and duvet covers. Pet with $ 500 pet deposit. Please CLICK 50 more photos LINK In the LINKS TO MORE INFO SECTION above the Owner's Profile and then select 'slideshow' for more Summer and Winter photos of each room, etc. (regional airports: Telluride (TEX), Montrose (MTJ). WIRELESS & LAN BROADBAND HI SPEED INTERNET accommodates VOIP telephone too. Short term LICENSE # 14007, LESS THAN 30 DAYS 12.4 % TAX ADDED TO RENTAL. LONG TERM IS OVER 30 DAYS AND NO TAX. Also, think about house exchanges in Southern California including Malibu and the Pacific Palisades where we go to the Bel Air Bay Club. This is perfect for walking around Telluride, along the River Walk, and with spectacular views as you can see in the photos. And the hard to find private jetted spa on the deck with VIEWS. Bluetooth for your iphone music, etc. Zen Garden at base of deck. We had an amazing time in Telluride. The house is perfect. Plenty of room for a family or two. Our kids, ages 5 and 3, loved having the bunk room to themselves (even though there are 4 beds) and the spacious master bedroom had plenty of room for us a for bed for our 6 month old. We loved WALKING (even thought the bus stop is right next door) to town and to the park that is right behind the house. 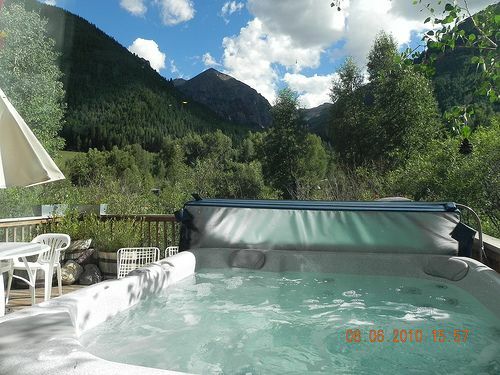 We enjoyed relaxing in the hot tub in the evenings and sitting out the back patio during the day looking up the canyon to the snow peaked mountains or across town at the free gondola that takes you up the mountain. This would be a great place to stay any time of year and we will be back. Also, the owner is very responsive, helpful and accommodating. The hosts are a great help and their home is perfect for a couple or a family or group! It is adorable and perfectly located on the sunny side of town. We are repeat guests and couldn't recommend more friendly and accommodating hosts or establishment! A Clean, well maintained, relaxing piece of paradise. Blue Lagoon is a charming home away from home, I would highly recommend it to friends and family. We loved our stay at the Blue Lagoon in Telluride. The Master Bedroom Suite is very comfortable and roomy with lovely views of the mountains and beautiful countryside from the second floor. There is also a washer and dryer which is very convenient to the master suite. A lovely bedroom suite is also available on the first floor if you do not want to climb stairs. One more bedroom, that can accommodate 4, is also on the second floor.. This home is an easy walk to downtown Telluride, close to all the quaint shops and delightful restaurants. There is also transportation via the Galloping Goose if you do not want to walk. There is a fully furnished kitchen, BBQ grill and Jacuzzi, most everything you could desire for your vacation comfort.. We would certainly rank this as a GREAT place to stay in Telluride. The owner was most helpful and accommodating to us. Enjoy Bluegrass from the deck and hot tub....across from town park !!! Childrens playgrounds, Festivals and unique Telluride learning centers. Free town bus comes to corner !!! BLUEGRASS 2017 IS A FLAT FEE OF $8500 FOR 3-15 NIGHTS...SEND A REQUEST AND WE WILL RESPOND THE SYSTEM DOES NOT WORK FOR A FLAT FEE OFFER WITH VARIABLE DATES.